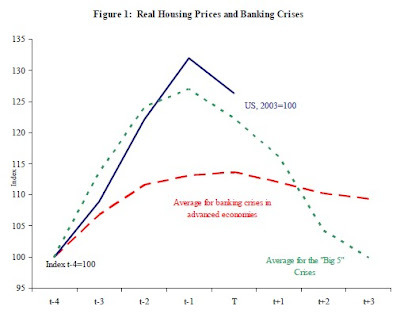 [A]ll major financial crises have been associated with some financial innovation or another. About one thing I am sure: The S&L crisis might not have taken place without the innovation of money market mutual funds. Could the LDC debt crisis have taken place without the growth of sovereign wealth funds? Could the Asian crisis have taken place without financial liberalization? Would the Japanese crisis have been easier to manage if corporate debt markets for good credits had not developed? Certainly Fox's claim is over the top. But history is rarely simple -- and every innovation has both costs and benefits. although not perhaps a "new" innovation, the choice of rolling back glass steagal did allow for a shift towards ever larger entities (2 big 2 fail) and a blurring of risks internally and externally. * Lending requirements were loosened as described above. * Deposit Insurance was raised from $40,000 to $100,000. * Enforcement of the law by banking regulators was decreased. * Politicians actively interfered in investigations of failing thrifts on behalf of specific S&L owners . * Implementation of the solution was delayed until the industry itself couldn't possibly pay for it and taxpayers were stuck with the bill." "In 1978, Congress amended the Internal Revenue Code by adding section 401(k), whereby employees are not taxed on income they choose to receive as deferred compensation rather than direct compensation. The law went into effect on January 1, 1980, and by 1983 almost half of large firms were either offering a 401(k) plan or considering doing so. By 1984 there were 17,303 companies offering 401(k) plans. Also in 1984, Congress passed legislation requiring nondiscrimination testing, to make sure that the plans did not discriminate in favor of highly paid employees more than a certain allowable amount. In 1998, Congress passed legislation that allowed employers to have all employees contribute a certain amount into a 401(k) plan unless the employee expressly elects not to contribute. By 2003, there were 438,000 companies with 401(k) plans. Did you figure out what the most important financial innovation for consumers is yet? No, it isn’t credit cards. It is the 401(k), created in 1980. Some stats: In 1983, 62 percent of workers relied on a defined- benefit plan; by 2007, only 17 percent did, while 63 percent only had a 401(k) or similar defined-contribution plan. Assets in 401(k)s had jumped from $92 billion in 1984 to $3 trillion. Notice how we normally talk about innovation in other markets doesn’t really apply here, nor does it help us understand what is going on. It’s the creation of a loophole in a tax bill; is the guy who saw this loophole for what it was like Thomas Edison discovering the light bulb? We can change it entirely with another tax bill. Is it an innovation over the pension? It isn’t obviously better than a pension (defined-benefit plan), like the Playstation 2 is obviously better than the Playstation 1." "Mike Konczal (he’s come out now) says, plausibly enough, that the most important financial innovation of the past 30 years is the 401(k). Which is not to say, of course, that it’s a good thing." I'm not competent to define what a Financial Innovation is, but I'm competent enough to have it explained to me, if someone would do so. As the Wikipedia explains the history of the 401 ( k), I don't see it as an innovation. It seems like some policy changes, just like in the S & L Crisis. Are CDSs and CDOs innovations? You tell me. You're an expert. Or were they used because of capital requirements? Are subprime mortgages new? Or were they just rare and used in safer circumstances before? It does seem that changes in laws are important in creating incentives and disincentives that help create financial crises. Am I wrong about that? The emergence of hedge funds as an international financial force was a huge player in the Asian crisis. Pooled international investment vehicles count as an "innovation", and lets face it the forex markets were not really all hugely traded until the 80's. The S&L crisis could be considered to be the result of "innovation" as as well, if you consider innovation to be regulatory arbitrage that it is. A bold statement by Fox, but you are really minimizing the "innovations" with your post. The common cause of financial crises, going all the way back to the South Sea Bubble of 1720, is an obscured price mechanism. When it is not clear what something is worth, it can be overbought or oversold. Financial innovations are related to this because they increase the complexity of the valuation process. Had the banks kept the subprime loans on their books in full, they would have monitored those accounts. But they had no incentive to care after they spun out the risk. Splicing and dicing into tranches etc may have spread out the risk but that reduced the monitoring and made the pricing an abstract, over-modeled process that was increasingly divorced from the reality on the ground. Innovation and regulation interact. Money market funds and credit derivatives are prima examples of innovations that circumvented regulation. In the case of money market funds, the target regulation (reg Q) was clearly idiotic. However, systematic regulation should have plugged the loophole: either outlaw or regulate. The credit derivatives case is similar but, due to the target regulation being global: capital adequacy), the consequences of an inadequate regulatory response were global. In general, useful regulation (i e one that achieves it legitimately determined and stated objectivs with few if any negative externalities) responds to innovation by not allowing a competitive, unregulated activity to exist in the space that regulation is mandated to order. I doubt that our western political systems are able to design and implement that level of regulation and, furthermore, do so internationally, on a voluntary basis. State bureaucracies (the regulators) and property rights will always conflict and politicians make rules that give the bureaucracy too little and leave distortions in the markets that sometimes lead to epidemics. It is inherent in our way of doing things. Solutions abound, but none that will work in reality. Very worthwhile post. Esp. the particular is an acronym accustomed to keep the head. I wouldn't have noticed the idea by myself. Must carefully examine previous photographs to determine this particular characteristic. Nếu bạn muốn giảm cân nhưng chưa biết phải giảm cân như thế nào! Tôi sẽ hướng dẫn bạn cách giảm cân bằng thực đơn giảm cân cấp tốc trong 1 tuần, công thức làm kem trộn trắng da, thuốc giải độc gan nào tốt, trị sẹo lõm lâu năm bằng phương pháp tự nhiên, cách mọc tóc nhanh cho nam, cách bôi kem chống nắng đúng cách sẽ giúp bạn có làn da trắng sáng và đẹp như mong ước. Should CDS be regulated as insurance?